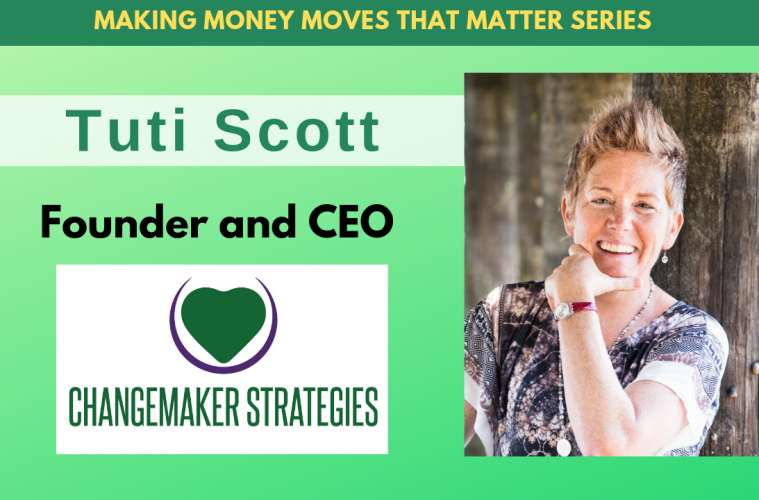 Throughout my career, I’ve been having conversations about what it takes for more women to get bolder and more engaged with their money. 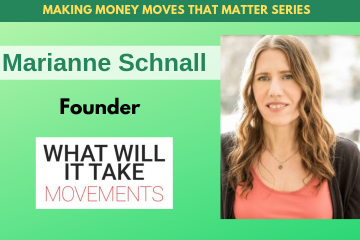 More and more people, especially fierce women, want to see their grantmaking aligned with their values and are eager to take their work to the next level through gender lens investing. For the past year, I have been speaking specifically about gender lens investing with the Women’s Funding Network (WFN) community and stakeholders. While gathering key themes and insights, the same issues continued to rise up for organizations, individuals, and investment committees wanting to get started in gender lens investing. 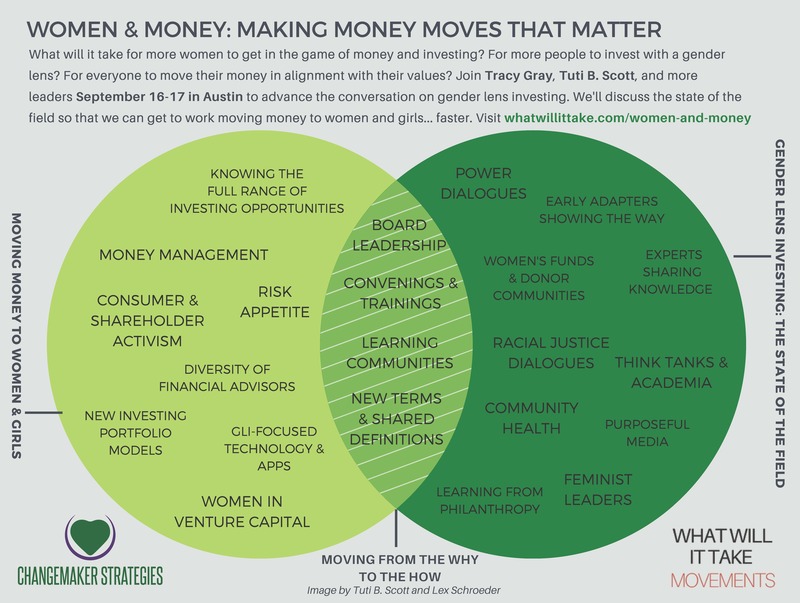 All of these topics and more will be discussed at the What Will it Take Movements’ gathering I am producing with Marianne Schnall and Intentional Media on September 16–17 in Austin: “Women and Money: Making Money Moves that Matter.” With this summary of highlights from conversations with the “women funded” community below, my hope is that we simply continue to close the knowledge gap and move to ACTION. (Read on for a link to a list of resources). Moving from the why to the how — What are specific examples of GLI products that a fund might invest in or that we can show to investment committees? Modeling and showcasing — What are some portfolio examples? What product opportunities exist? Who are the financial advisors who offer and/or promote these funds? Range of investment opportunities — What products and spaces for impact are out there (from entrepreneurship to loans to microfinance to equity funds)? How does the size of the fund’s endowment influence the potential for active work in GLI? Money management — How do we influence where the money is held if we are not part of the investment committee or don’t have knowledge of how the funds are invested? Risk appetite — How can we engage with investment committees to expand the knowledge they have received from traditional financial advisors while expanding appetites for risk? Activism appetite — What concrete campaigns or ideas do we have about where and how to engage in shareholder activism, consumer activism, and proxy voting opportunities? Definitions and language gap — What are shared definitions and resources we can use when it comes to GLI and impact investing? Field expertise — How can we help close the gap in leaders “owning” their understanding of women’s issues, leadership, and/or money as leverage points to enter conversations on impact investing? Making the case — How can we better connect philanthropy and investing to mobilize even more money to women and girls? What shared messaging or stories of impact can we read and share? Community learning — What study groups do we need to build around GLI? Are there materials and templates we can share to use as study materials with leaders/peers and to educate donors? How might we recruit leaders in finance and work with them as resources and partners? Diversity of financial advisors — Why are there so few women financial advisors and how can we educate women on the career opportunities within financial advising? How do we help men financial advisors understand and support GLI? 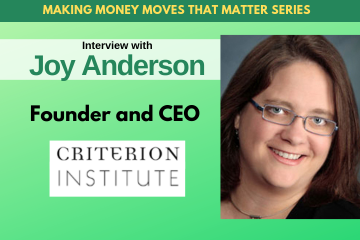 Conversations and/or trainings — We know that getting people to talk about money (whether in philanthropy or investing) builds philanthropic leadership in any given community. What does this mean for promoting conversations about GLI? Board leadership knowledge — Do boards understand the interplay between grantmaking and investing (or impact investing)? If not, what stories or information do boards need to understand these relationships better? As next steps, with WFN and Tides, I am in the process of creating a gender lens, impact investing guide that will serve as an accessible, “how to” resource for more people to learn the language of gender lens investing. We’re also gathering lists of advisors and firms in this space as well as sample portfolios to share widely. For now, here is a working list of resources.